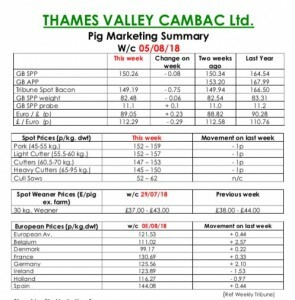 This was another quiet week trading, according to the Slaughter Pig Marketing Summary from Thames Vallay Cambac. Supply remained tight but demand was steady with many processors requiring less than contract numbers. As well as dampening demand, the holiday season also affects staffing levels at factories, prices eased again with reductions of 1p to 2p in contract contributions. The fresh meat market saw similar price falls, with poor demand being reported in many areas. The cull sow market were similar on the back of some stability in currency and continental markets. In Europe, both Germany and Belgium improved by 2 eurocents, and all quotes in sterling appreciated as the Euro strengthened to end the week up 0.23p at 89.05p. Finally, a reminder to producers that the deadline for submitting Q2 EMB antibiotic data is the end of this week, August 11. In the Weaner Marketing Summary, for week commending July 29, demand was very poor, with little interest in any batches not on contract. 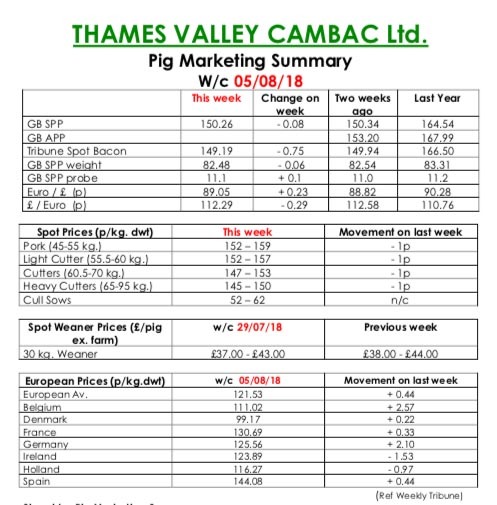 The prices announced by the AHDB saw the weighted average for a 30kgs pig fall by £2.05 to £53.34 and the weighted average for a 7kg rise by 49p to £39.49.